15 Responses to Could WordPress.com Create a Disqus Killer? Why is this categorized mba ? Is the categorization of all wordpress categories intentional or is it by error ? The seesmic/ disqus association that may have put on a raising direction … i think. I’m always amused at people wanting to claim all of their comments as their own content. I take a different view of the situation. When a person contributes their opinion via a comment they should act as if they’re giving a gift to the site on which they’re commenting. For some people that’s not good enough. They must have control! The best way to retain control over your comments and retain your brand is to write the comment in a blog post and link back to the original post they are commenting on. Alas, Disqus doesn’t support trackbacks. That’s because Disqus wants a bloggers users to have to interact with their system. @My Blog Posts – the MBA category is my owen internal blog category. I categorize pots as either Geek or MBA. Geek for posts that delve into functionality. MBA when I’m talking about more business-related aspects. My tags are specific to the post and describe the posts more directly. @Frédérick 2 Baro – We’ll need to see how viedo comments fair. I think they’re interesting, but I’m not sure about how widespread they’ll become. Part of it is that they take time to watch/listen. Contrast that with quickly reading comments. But I do like the experimentation behind disqus/seesmic. @Rob Safuto – that’s a good perspective. As a commenter, you’re a content creator, like blogging or twittering. 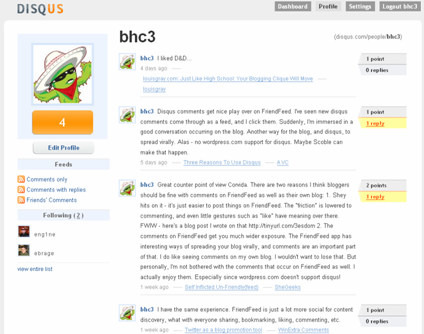 Disqus lets you see your content across sites. I don’t need control, but it’s really interesting my comments collected in one place. Creates a ‘comment blog’. Hutch, I may have missed it, but why aren’t you using Disqus here? I can tell you for a fact that it has increased my commenting on blogs. @Vince – WordPress.com doesn’t allow disqus right now. Maybe if someone was using wordpress.org? But since I’m using WordPress.com’s hosted service, it’s up to them to enable disqus. A very nice post Hutch. I am a little amazed at the press that Disqus is getting these days, almost as if someone is “pushing” from behind the scenes. There is in point of fact already a Disqus killer out there and one that reaches much farther afield. 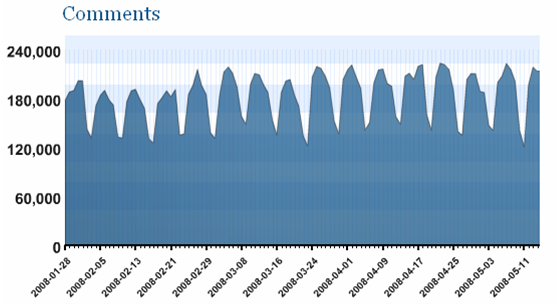 JS-Kit launched some months before Disqus did and is currently utilized (unofficially but in reality) on over 50,000 blogs and sites. Recent or upcoming news will reveal that JS-Kit is penning deals that will soon take its user base way over 20 million users engaged. Aside all this rather unnoticed news, Disqus has several problems that cannot be overcome in any short term. Disqus uses a rather proprietary approach to everything from login to data storage and portability. Beyond these content ownership and usage issues combined with multiple sign in aspects, the monetization scheme is flawed (and invisible now). JS-Kit is almost open source (or soon will be) and is achieving a level of compatibility that Disqus may never even want to, given their current plans. It appears that Disqus is essentially approaching “locking” users into using them because leaving Disqus spells disaster in as far as comment content and its inherent SEO value are concerned. Kit by comparison, can be dumped at any time without losing data or SEO. It should be noted that content stored on Disqus is not even crawled for the resident blog, but on the Disqus index pages. People should pay closer attention to what they are getting when signing up for these services to be blunt. Big deal, 4000 idiot bloggers signed up to have their content robbed, to have to use multiple signins, and for a monetization model that is at best “hidden”. I was perhaps the first blogger to test and review Disqus when it came out. Their PR essentially asked me to do a writeup and I did. I found Dan and his innovation to be exceptional, but this was before some of these issues came to light. If your data is on Disqus and you decide to drop the service, it is just so sad so sorry for your reader’s contributions. Just yelling “Yeehaa!” and diving into something because BOB next door says so is not always the best choice given the effort people put into their blogs. What if Disqus decides to start charing $20 a month to use their service? I know, you can holler WTF and go install JS-Kit. Unfortunately, Disqus will have already derived value from your user content and you will never get it back…even if they wanted to give it back. Phil, I notice that you leave out that JS-Kit will require running ads (which they claim will give you a currently undisclosed rev share), and if you don’t WANT them to run ads, then you have to pay them a subscription fee to remove them. That’s not open source in any way, shape or form (Open Source Initiative). Disqus also allows anyone to export the comments (http://disqus.com/help/#faq-6) at any time, so claiming that you lose content if you drop Disqus is false. Is there some sort of personal interest in JS-Kit? I’m all for competition, but not when it’s at the expense of disparaging another company with false information. Your “critical feedback” has become more and more disparaging as you continue “crawling” the web for any mention of our service. I have corrected your inaccuracies on numerous occasions, and I would appreciate you addressing them. You need to disclose that you are a PR/media consultant for JS-Kit. It provides some very crucial context to what you say. One thing. WordPress will not offer their “disqus-killer” to non-WP users which is more than the number of WP users. So it’s not and won’t be a disqus-killer. If WP wants to create their own closed world, so be it. For the rest of us non-WP users, we’re open and we welcome new innovations. The day will come when Blogs, Forums, and CMS will start stripping down unnecessary features (by then its unnecessary) like Comments System in favor of services like DISQUS and FriendFeed. There’s just no point keeping those built-in features if your users are using third-party services already. And I believe a SezWho+DISQUS+FriendFeed power-trio is very possible. Can’t wait for Outbrain to join the picture. And too bad. I don’t know if I’ll be back here to read comments. WordPress.com is “disconnected” from the world. This possibility can’t be excluded I think. It would actually be a pretty interesting move, a “WordPress.com” plugin for the open source WordPress.